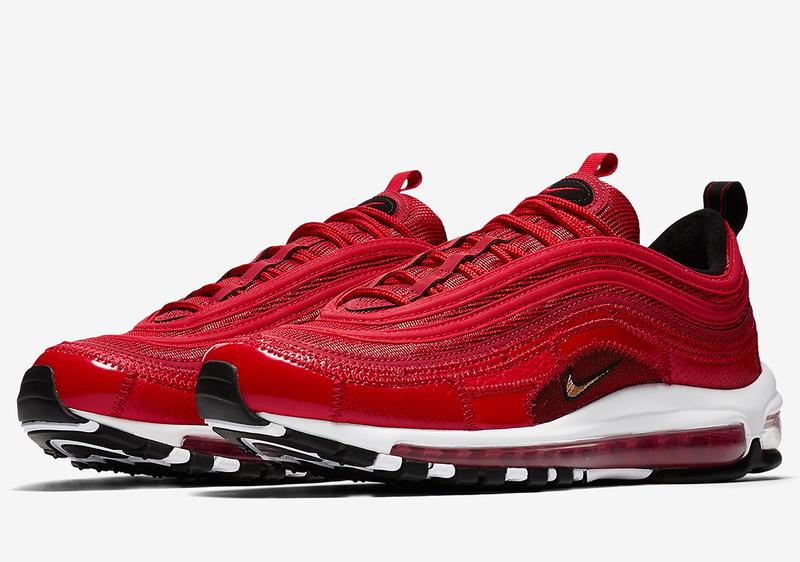 Update: The Nike Air Max 97 CR7 is releasing on April 1st in Europe. Nike is continuing its Cristiano Ronaldo story with another Patchwork addition to its Air Max 97 line that already features a golden-clad design. This time around, the Swoosh dresses the model up in red with green and yellow lace options in honor of Ronaldo’s home and the national team he plays for – Portugal. Patchwork detailing furthers the story of CR7’s mother patching his shoes back together when he was younger to keep him going on the soccer pitch, which helped drive him in becoming one of the greatest footballers of all time. Much like the last offering Nike replaces the “97” on the heel tab with “CR7” so its reads “Air Max CR7”, another homage to the world renowned superstar’s nickname. There is currently no information available regarding a release, but Ronaldo’s last 97 was only available overseas. Stay tuned to Sneaker News for updated information and enjoy a full set of official images below.